Not much doing at Dru tonight, I called in for an hour or so after work and ended getting absolutely soaked. I did get a year tick though, two grey wags flying south whilst I was chatting to another year tick - Duncan from NWT who was feeding the cows! After checking the pools and bushes, which a held a scattering of thrushes including a redwing, I walked back along the beach to see if there were any seabirds washed up after the oil slick (see http://news.bbc.co.uk/1/hi/england/7657120.stm ) - not a one, maybe someone has been and gathered them up already? 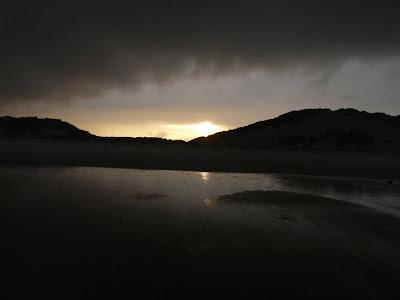 It was when I was at the top of the beach, furthest away from the car, that the heavens opened - it create this spooky sky though, it got weirder but camera was already soaked. 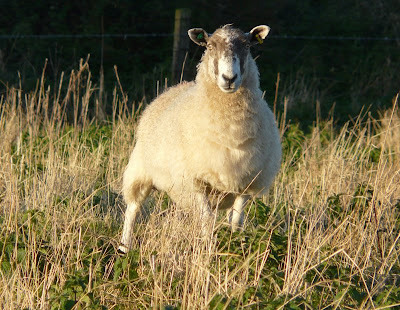 I took this shot of one of the mad sheep that have been grazing the National Trust bit around the entrance willows - and doing a good job! Well for some reason I've never been in The Bill Oddie Hide and couldn't believe my look to see the Bittern in the reeds to the west of the Hide and 10 Whooper Swans. And met two birders from Leeds, great day. matzappa - you had a Bittern at Druridge .....when?????? 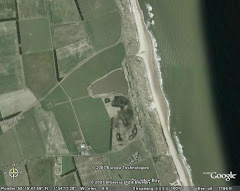 Its mentioned on someones blog earlier and when I got to the hide it was marked on the board at 12:40. I was just scanning the reeds and it was in the reeds west of the hide. Eventually it flew over the pool and land at the North Easterly reeds. I was a happy man as its a first and magnificant to watch with its bill upright. If there was a board i'm guessing you weren't in the Oddie Hide at Druridge, but in the hide at Cresswell Pond and there has been a bittern there. We don't have a board at Dru cos the wazzacks just vandalise them.... phew....Nice bird to see anywhere though! My mistake, I thought that was the BO hide. It was a great day for a beginner.